Credit Card Types define the different credit cards that you can accept. You typically do not have to change anything in this setup, since it is defaulted to all major credit card types. 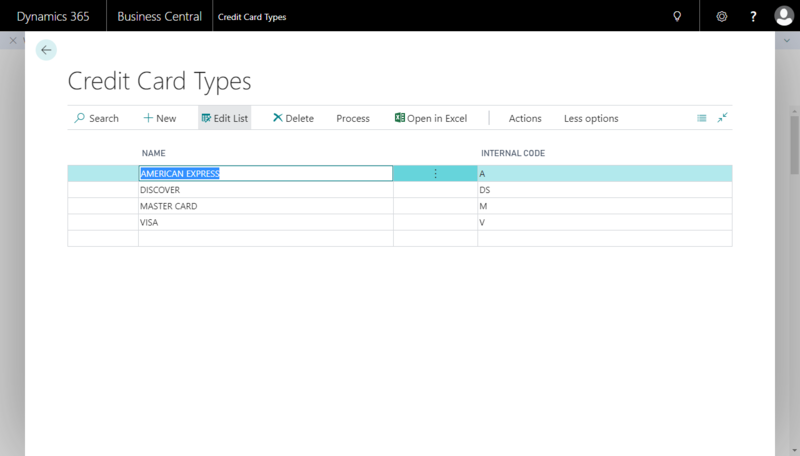 This page can be accessed by entering “Credit Card Types” in the Dynamics 365 Business Central search box. The name contains the name of the credit card type as it is displayed throughout the system. You can change the names for a credit card type, if you see fit. The internal code is the code that is returned from the gateway for each credit card type. Please do not change these values unless instructed by the gateway or by NAV-X. If you change this code, it could result in the functionality not working properly.